Gold Star families, we are so sorry for your loss and grateful for your sacrifice. 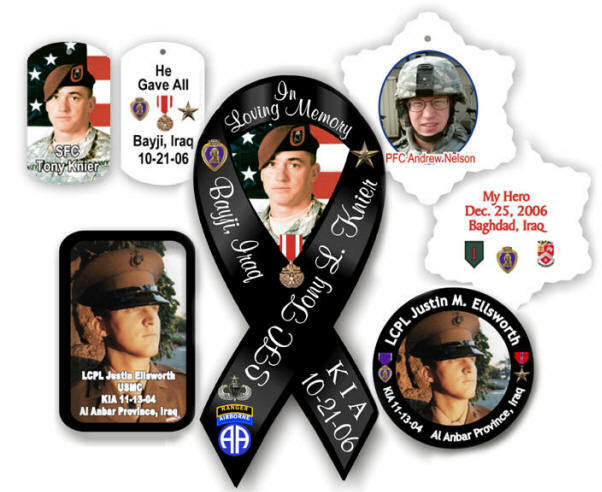 We have found that many families want to honor their fallen soldier's memory with ribbon magnets, photo dog tags, buttons, photo patches, and ornaments. We have tried to make it easy to order these here in one place. If you are wanting to order for personal use, for a memorial or funeral, or for a benefit event, we can help you. If you need quick turnaround to make a particular date, let us know. We will put as much or as little information on the products as you wish. You can include the photo, name, a message, date of death, location, unit emblem, medals awarded, a favorite poem, and just about anything you would like. We can make it fit. Your message can vary for each at no extra charge, as in My Cousin, My Brother, My Daddy. You can be very specific about how you'd like us to arrange the design, or you can let us show you what we think will work based on our experience with other orders. Below are some of the products other families have ordered. The order entry section begins after the products are described here. You can jump directly to the order entry section. 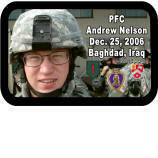 Our magnetic ribbons include a picture of your soldier plus a custom message on one or both ribbon ends. You can choose to have your magnet cut in the shape of the black ribbon, add a rectangular flag background, add a white cross or other religious emblem, or use a flag instead of a photo. Choose an 8" or 13" tall magnetic ribbon for a vehicle or front door, 4" tall for a refrigerator magnet, or a 6" tall sticker for your car or house window. Glossy mylar top and 3 mil magnet back. Image will last 6 months or more in continuous sunlight. Remember to move regularly and place on a clean surface. Remove for washing. Made with Car-Safe magnet backing. We offer photo dog tags at no charge for the fallen soldier's immediate family, as a small token of our appreciation for your great sacrifice. These are for parents, grandparents, siblings, spouse, and children of the fallen soldier. Tags are a reduced flat rate for friends and other family. Aluminum tag, 1 1/8" x 2", permanent imprint. Buttons are an inexpensive way to remind people you see of the sacrifice your family has made. Your buttons can include emblems, unit crest, a favorite saying of your soldier, etc. 2 1/4" round button, pin back. Patches are popular, and our dyed patches can reproduce photographs, unlike an embroidered patch. Circles and rectangles work well, and we have some oversized patches that can display your pride in a big way. Permanently dyed image, stitched edge. Washable, dry cleanable, scrubbable. Made with the same process used for colorful polyester clothing. 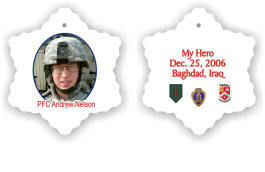 Remember your fallen soldier afresh each year with a keepsake porcelain ornament. 3" snowflake shown, other shapes available. Porcelain ornament with image on both sides and gold hanging cord. Approx. 1/4" thick. begin by providing information about your soldier. We will show you a proof of everything before we make the products. This will include a rectangular flag background. * You can have different messages at no charge. Indicate 3-My Brother, 1-My Son, for example. * You can have different messages at no charge. Indicate 3-My Cousin, 1-My Nephew, for example. Most people use a photo and a 3x4 rectangle. Block text usually is the clearest for these patches, and the text color will be white or black, depending on what shows up best against the clothing.